My toy breed puppy has been diagnosed with hydrocephalus. What is it? Hydrocephalus literally means “water on the brain.” The “water” is actually an excess of cerebrospinal fluid (CSF) that has leaked inside the skull, leading to brain swelling. CSF is the fluid that surrounds the brain and spinal cord, providing both nutrients and protection. Buildup of CSF can occur in the brain if the flow or absorption of CSF is blocked or too much CSF is produced by the body. This leads to increased pressure within the skull that presses on the sensitive brain tissues. Increased intracranial pressure can lead to permanent, irreversible brain damage and death. What causes hydrocephalus in dogs? There are two main types of hydrocephalus in dogs: congenital (present at birth) and acquired. Congenital hydrocephalus is a birth defect most often associated with a dome-shaped skull (sometimes referred to as “water head” or “apple head”), a large fontanel (“soft spot”) on top of the skull, and eyes that appear to gaze downward (called the “setting sun sign”). Affected dogs may not have any obvious clinical signs (symptoms), especially when they are very young. Clinical signs associated with congenital hydrocephalus include abnormal or spastic walking, changes in behavior, circling or falling over on one side, and failure to housetrain or learn basic commands. It is important to note that not all puppies with large fontanels will develop hydrocephalus. Clinical signs associated with congenital hydrocephalus include abnormal or spastic walking, changes in behavior, circling or falling over on one side, and failure to housetrain or learn basic commands. Acquired hydrocephalus develops when the flow of CSF is blocked or altered by infection, tumor, or swelling. The most common cause of acquired hydrocephalus is a brain tumor. Clinical signs are similar to those of congenital hydrocephalus and include changes in behavior or training, circling, head pressing (a term used for pressing of the head up against a wall or other structure), listlessness, loss of vision, pacing, restlessness, and seizures. 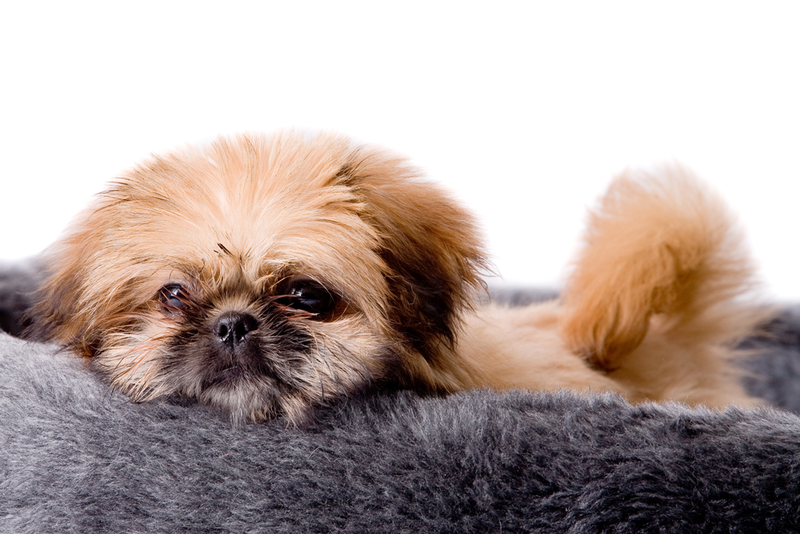 Are certain breeds more likely to develop hydrocephalus? Small, miniature, and toy breeds seem to be more affected. These breeds as well as brachycephalic dogs (those with shorter faces), include the Boston terrier, Chihuahua, English bulldog, Manchester terrier, Pekingese, toy French poodle, and Yorkshire terrier. In young puppies, a large fontanel and clinical signs consistent with hydrocephalus are usually all that are needed to make a presumptive diagnosis. Ultrasound evaluations through the fontanel can reveal dilated or enlarged brain ventricles (open areas in each half of the brain). Brain scans using computed tomography (CT) or magnetic resonance imaging (MRI) can also be used to diagnose hydrocephalus. In cases of suspected acquired hydrocephalus, CT or MRI is necessary to make a definitive diagnosis. Electroencephalography (EEG), which involves connecting electrical sensors onto the head in multiple locations, may also be used to aid in diagnosing hydrocephalus. In the acute or early phases of hydrocephalus, treatment is directed toward reducing CSF production and inflammation by using corticosteroids (steroids, such as cortisone or prednisone). In more severe or chronic cases, anti-seizure medications will be needed, and drugs such as furosemide, acetazolamide, and omeprazole may benefit affected dogs. Surgery to place a tube that runs from the open spaces in the brain to the abdomen (ventriculoperitoneal shunt) can be performed at some veterinary teaching or specialty hospitals. Success rates as high as 80% are reported in cases treated early. Considerable risks and potential complications are associated with this procedure, so be sure to thoroughly discuss the benefits and risks of shunts with your veterinarian. For acquired hydrocephalus, therapy is focused on treating the underlying cause and may range from medications to surgery to radiation therapy. Should dogs with congenital hydrocephalus be bred? Absolutely not. Because congenital hydrocephalus is a birth defect, both parents should not be bred again. What is the prognosis for dogs with hydrocephalus? The prognosis for hydrocephalus depends on its duration and severity. In general, hydrocephalus in dogs is a serious, often life-threatening, condition. The forecasted outcome for hydrocephalus depends on its duration and severity. Puppies with congenital hydrocephalus may do well following shunt placement if severe brain damage has not occurred. Dogs with acquired hydrocephalus have a poorer prognosis due to the likelihood of an underlying tumor or infection such as encephalitis (inflammation of the brain). Your veterinarian will discuss your pet’s prognosis and treatment options based on its individual condition.